These days, nobody doubts the importance of Manet — at least, nobody with eyes in their head. He’s rightly seen as a game-changer in the story of art, the man who opened the door for the impressionists, or, as the Musée d’Orsay put it a couple of years ago in a gripping celebration of his impact, The Man Who Invented Modernity. But although we know all this about him, it remains, on these shores at least, a largely theoretical knowledge. There simply aren’t enough paintings by him on regular public display for us to form anything other than a partial view of his accomplishments. ­Celebrated though he is, Manet hides in the spotlight’s glare and manages to remain a stubbornly mysterious figure. So I welcome the Royal Academy’s examination of his portraiture with the sort of relief the Bedouin must feel upon spotting an oasis. At last. A Manet show. And it’s particularly cunning of the academy to focus on his portraiture. Every Manet exhibition has to face up to the inescapable truth that his most important paintings, the ones that changed the story of art, are bunched up in the Musée d’Orsay, from where their French captors are reluctant to release them. In particular, the two paintings that trod most heavily on the tail of the 19th-century bourgeois, Olympia and Le Déjeuner sur l’herbe, are never going to leave Paris. By shifting the focus away from Manet the leader of art’s great rebellion towards Manet the intimate portrayer of his circle, this show successfully allows another kind of artist to emerge: Manet the family man, Manet the technician, Manet the connoisseur of beauty. An event that seems to be concentrating on a small corner of his achievement ends up painting a bigger picture. The first room is the most engrossing I have walked into in a long while. It focuses on the two sitters who appear most often in Manet’s art: his wife, Suzanne, and his son, Léon. Yes, yes, I know there is plenty of juicy controversy about who actually fathered Léon — was it Manet the painter or his father, Manet the judge? — but the most reliable ­evidence on the subject is surely Manet’s art, in which Léon appears too often and too fondly to be anything other than a son. In Boy Blowing Bubbles, he’s a ­charming ragamuffin fatefully inflating that familiar symbol of life’s fragility — the soap bubble. In the delightful little sketch called The Velocipede, he is shown sitting astride one of the new­fangled bicycle contraptions that had taken the place of d’Artagnan’s horse on the streets of modern Paris. 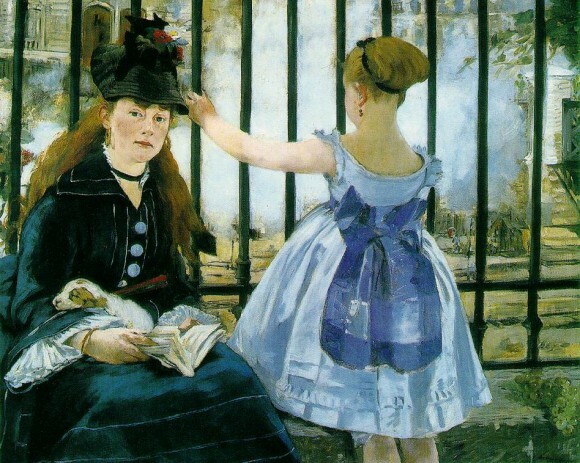 Manet’s portrayals of Léon seem always to include these loving paternal ruminations on the boy’s future. It’s a process that reaches its climax in a fabulous picture called The Luncheon, painted in 1868. It shows Léon, aged about 16, dressed as a contemporary dandy in a black velvet jacket and straw boater, ­trying to lean nonchalantly against a luncheon table in the preferred French manner. He doesn’t quite pull it off. He’s just that bit too young to be dressed like that, and a note of teenage self-absorption haunts his podgy face. Manet, who is underestimated as a psychologist, makes something fascinating as well of the interaction at the back between the servant girl bringing in the coffee and the bearded painter, puffing at a cigar, who examines her like a grizzly who has spotted a honey pot. A black cat licking its privates on the chair at the front amplifies the volume of this sexual frisson. This, you sense, is the kind of ­liaison that bred the young dandy. What Manet has done here, brilliantly, is to paint a picture set in the modern world that carries the symbolic heft and ­complication of a knight’s tale by an old master. Once, Léon would have been a brave young warrior setting out on the road of life in the helmet and breastplate that lie on the chair, next to the cat. Now, he’s a pretend dandy in a boater. With Manet, there is so often an ironic note to his observations of modernity. Suzanne, the painter’s wife — plump, red-cheeked and Dutch — is the focus of a less complicated set of portrayals on the other side of the room. Usually, it’s just her and her dress. She has been given a hard time in Manet literature, particularly by French writers, who are often of the opinion that he was too good for her: the brilliant French dandy trapped in a regrettable union with a heifer from the lowlands. But Manet liked to paint her from her best side, the left, studiously playing a piano in her salon, or sitting with a cat on her lap in a dress so crazily pink, it seems to explode out of the surrounding domesticity. By bringing all these lovely portrayals of Suzanne together, the show issues an important corrective about her leading role in his art. This opening room is so gripping that the show that follows is doomed to feel a tad patchy. It seems a strange decision to give the lively but small Music in the Tuileries, from the National Gallery, a huge gallery to itself in which to rattle about like a fork in a cutlery drawer. ­Perhaps a few of the hoped-for loans have gone missing? Further along, some of the unfinished works that have been included are so unfinished, it would have been kinder to leave them out. It feels wrong, as well, to interrupt the thrust of the art with a documentary account of Manet’s life situated not at the beginning of the display, nor the end, but a third of the way along. Finally, however, it ­matters not a jot that the show has been chaotically curated, because every painting here seems to set its own adventurous agenda. Manet was a fabulous painter of women. He clearly adored them and seemed even to collect them, as a ­connoisseur might collect fine wines. I loved the picture of the painter Giuseppe de Nittis and his wife, in which the ­ravishing Mrs de Nittis takes up most of the foreground in her big summer dress, while her poor old husband is squashed into the back, like some luggage thrown into the back seat of a Morgan. The beautiful impressionist Berthe Morisot, who became darkly infatuated with Manet, pops up in a couple of ­adjacent pictures, once as a belle époque stunner in a black dress, then as a wild-eyed harridan weeping angrily at a funeral. Few painters in the history of art could have captured two such different moods with fewer brush strokes. Although this is billed as a showcase of Manet’s portraiture, it’s almost always a good idea to look away from the faces and inspect the rest of the picture. At first sight, the standing portrait of Antonin Proust in his frock coat and top hat may strike you as particularly stern. Lean in for a closer look, though, and you’ll see that the rose in his buttonhole has been encapsulated by a cluster of brush strokes breaking some sort of speed record. Manet was unusual, too, in being as good at painting men as he was women. One masterpiece the Musée d’Orsay has allowed out is his famous portrait of Emile Zola sitting at his desk, with a ­Japanese screen behind him and a print of Manet’s Olympia on the wall. For an immediate insight into Manet’s genius, take your eyes off Zola for a moment and peer instead at the way in which the ­clutter on his desk has been evoked: the yellow paperbacks, the pale blue book covers. Even Van Gogh would have thought twice about daring such briskness. The way the floral chair Zola sits on has been slashed into existence is worth the entrance fee on its own. Thus, Manet’s touch is the real star of this show. His exciting brush strokes, so quick and fearless, quiver and skip to the rhythms of modernity. Perversely, it’s something that seems easier to appreciate in the absence of the great masterpieces that will never leave Paris.